Getting a big, red pimple on your face happens to literally everyone, but that doesn't mean you have to accept defeat and wait patiently until the blemish goes away. Trade your oily fingers for a warm compress, for starters. First, it's important to understand how blemishes work (knowing your enemy is half the battle, after all). "We have sebaceous glands in the skin that normally provide moisture and lubrication, but the combination of stress and hormones can form clogs," explains celebrity dermatologist Dr. Marina Peredo. 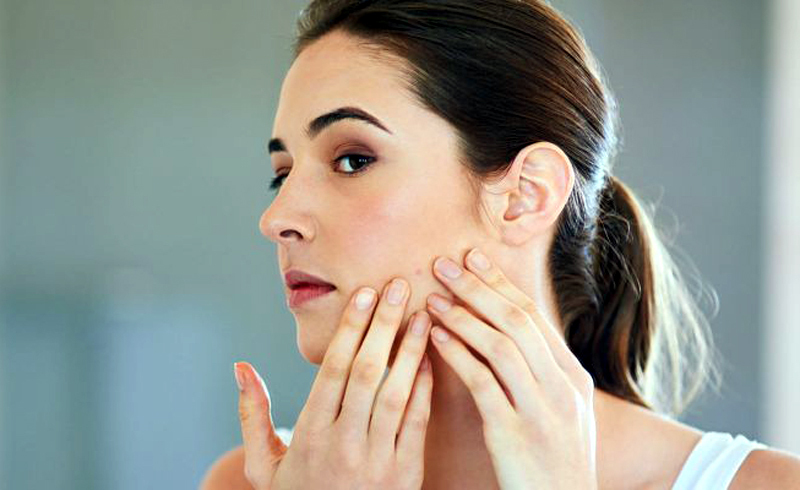 "The bacteria causes inflammation in the skin, which is why blemishes and acne form." And voila! Just like that, your skin flares up. So, how do you free yourself of this pesky inflammation? Here's how dermatologists recommend getting rid of that big ol' zit as soon as possible — and how to avoid making it worse. Heat is a super simple way to soothe your skin if you feel a blemish coming on, says Dr. Margarita Lolis, dermatologist at Skin and Laser Surgery Specialists of New York and New Jersey. "Use a warm compress or steam to bring everything to the surface," she explains. And once your pimple appears, apply a spot treatment. Alternately, you can use a cold compress to bring down the swelling of a particularly large, painful blemish. Continue washing your face regularly. "Your oil glands are active all day," explains Dr. Joshua Zeichner, Director of Cosmetic & Clinical Research in Dermatology at Mount Sinai Hospital; when that oil combines with dirt, makeup, and pollution, it's not doing your skin any favors. That goes double for workouts. "Sweat mixed with dirt and oil can become trapped under wet workout clothing," potentially worsening a breakout. "If you can't take a full shower," Dr. Zeichner says, "at least use a cleansing towelette," like Good Housekeeping Beauty Breakthrough Award winner and Seal holder Olay Daily Facials Daily Clean 4-in-1Water Activated Cleansing Cloths. Apply a spot treatment with three ingredients. In a pinch, get a cortisone shot. Try a salicylic acid cleanser. Go light on your makeup. Unfortunately, using heavy coverup to make your blemishes visually disappear won't make them physically disappear. "Use mineral makeup on your skin rather than oil-based products that can contribute to breakouts," recommends Dr. Peredo, adding that oil-based foundation and concealer can be very occlusive. You can even do yourself one better and go totally makeup-free for a few days — it could be just the break your skin needs to clear up quick.